I’ve always been pretty lucky. 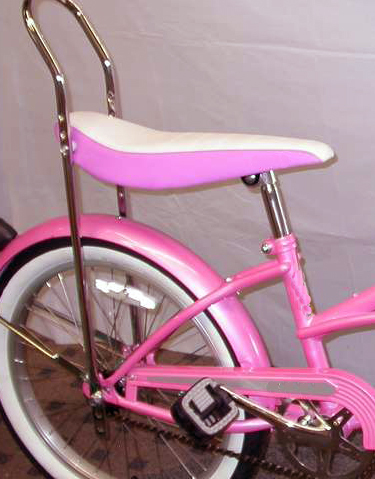 For instance, during Bike Safety Week in 1967, I was absolutely sure that I was going to win that beautiful, hot pink bike with the banana seat. I knew it. And I convinced my little brother of it who was a kindergartner. He was really upset that I was going to get a new bike and he wasn’t. He began complaining about it at the beginning of the week. My parents got so sick of hearing him say, “Anita’s going to get a new bike and I want one too!” that my mom, desperate for him to quit whining about this said, “Oh, David, if Anita wins that bike we’ll get you one too.” She never believed that I would be the lucky kid to win. But I knew I would. We were late arriving at the school event that marked the end of Bike Safety Week, but as I jumped out of the car I heard my name being announced as the winner over the loud speaker! My parents couldn’t believe it and David was thrilled for me, well, not really for me, but for the fact that he was also going to get a new bike! Jump forward to 2005. I’d never been to Europe so when, at the beginning of the school year, my school mailbox was filled with educational travel companies’ catalogs, I couldn’t just throw them away like junk mail as so many of my colleagues did. I loved looking at the pictures and I would even find myself cutting out pictures of the Eiffel Tower or Big Ben and keeping them in a collection in an envelope at my desk. The ACIS catalog was my favorite. The design and layout of the pages begged for my attention. Toward the back of the catalog was a form that advertised the possibility of a free trip if the form were filled out and sent in. Typically, I’m not a coupon-clipping, survey-filling-out kind of person, but my mind was dreaming from looking at those pictures, so I filled it out. After mailing it in that afternoon I promptly forgot about it as the new school year got underway. In fact, I never thought about it again until I received an email the following May, just weeks before school was out. The email said that my name had been randomly selected to go to Paris and London with a group of 20 educators from around the country. I couldn’t believe it! I won! And so I went and that free, expense paid trip changed my life. Those two cities are forever burned into my memory and I ache for them still. That trip has informed so many of my decisions since then. Not only do I “do” my finances differently by using mileage-attached credit cards for all my expenses each month to earn mileage points, but I’ve taken my daughter to Europe and have influenced great change in her life as well. Additionally, my interest in European history has flourished and I’ve added historical fiction novels to my list of favorite, “must read” books. I’ve taken 1-1/2 years of French language classes and I listen to music from around the world. I was so inspired by French and English gardens that my personal artwork completely changed. Since 2006 I’ve been to England (London, Bath, Devon, The Cotswolds, Jersey Island), France (Paris), Italy (Venice, Florence, Rome), Austria (Innsbruck, Mittersill), Scotland (Edinburgh) and Turkey (Istanbul, Izmir, Alacati). Travel really does change lives. It changed mine, and I look forward to even more change in the future as I continue to make a life full of travel. How has travel changed your life? I’d love to hear your stories and comments! PS What’s the dish on getting free air miles?? As I mention in my blog, go research Chris Gillabeau’s website. He tells all about miles. Thank you for writing in! Believe me, there’s been plenty of times I didn’t win also. But the image I’m trying to paint is this: sometimes, deep in my soul, I “know” something. The small, quiet voice of my inner being whispers and I “know”. There aren’t that many times that I’ve felt that way, in fact I didn’t feel that way about winning the Europe trip, but I did “know” how desperately I wanted to go there. I think of life as a metaphor used by CSLewis: a long hallway with many doors. We have to act by walking down the hallway, knocking at each door – – sometimes even opening the door and peeking in and asking ourselves if this is the right door or not. If it is not, I keep going down the hallway knocking on doors, turning over rocks, climbing up mountains, untie’ing knots and filling out surveys. I’m constantly listening for the whisper that confirms that it is the right door, rock, mountain, knot. Just keep knocking and asking! And then be brave, my friend, and do it. I enjoyed the post about the gems. I think this is the problem with most people. We, myself included, live our life to please others, or sometimes by a list of rules, missing out on our own “Uniqueness” . When we recognize our strengths and weaknesses and accept them, we find joy. I think this is especially difficult for young people today – they try to please parents, teachers, or conform to the image that is presented by media. What would the world look like if we rejoiced in the way God created us and realize that each of us has a purpose that can make an eternal difference . This blog is wonderful, congratulations! The stories, the design, everything looks great and I am looking forward to reading every week! Thanks, Merry! You are such an encourager to me. 🙂 We’ll have to celebrate with sushi or coffee soon!